Lekker Living in South Africa, Issue #001 -- Welcome to South Africa! Please share this newsletter with your friends and family and spread the word about this awesome country and its amazing people. 'Sawubona' means 'Hello' or 'Good Day' in Zulu. This term is used as a greeting for one person, if you greet a group of people, you say 'Sanibonani', which means if literally translated, ‘I see you’. You can answer either with the same word, or you reply: 'Kunjani? ', which means 'How are you?'. Then you reciprokate with 'ngiyaphila' which means 'I am well'. South Africans will appreciate your effort as a sign of respect. There are 11 official South African languages, Zulu is with more the African language most spoken and understood by the locals. Over 22% of all South Africans speak isiZulu as their home language. 'Sawubona', 'Sanibonani' and 'Kunjani' are certainly the words all South Africans will understand. So let's start to learn to communicate in a local language and have a great start to living in South Africa! * Go on Safari: Winter in South Africa is a great time for experiencing the wildlife in the high veld. As winter is a dry season for most parts of the country, viewing game is easier at this time due to better visibility in the dense bushland. Days are usually sunny, however, have a warm coat, hat and gloves handy when exploring the nature during an evening or early morning safari outing. * Swim in the Sea: Along the KwaZulu-Natal coast, you can experience warm waters all year round. In winter, the air is less humid and sunny days still invite for strolls along the beach or a dip in the Indian Ocean. The coastline is pristine in winter whilst in many other parts of the country the people have to dress warmly. * See the Snow: In the Cape, winter is a great time for lazing around the fireplace, enjoying leisurely strolls through the vineyards or tasting local wines and delicacies, such as artisan cheeses and chocolates, without the crowds. If you long for a real winter dreamland, make sure you visit the Cederberg area when the snow and winter cold 'hit' the Cape. 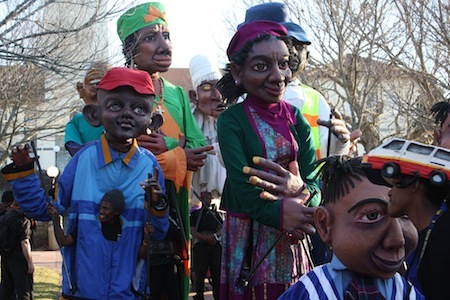 Visit Grahamstown, also dubbed 'Festival City' and see some great performances at this year's National Arts Festival. This year, the festival will take place from 3.-13. July when it celebrates its 40th anniversary. Grahamstown is located in the historic heartland of the Eastern Cape. The town, 170 km south west of Port Elizabeth, annually hosts the world's second biggest annual arts and cultural festival, the National Arts Festival. Scattered across town are more than 50 venues all celebrating the arts and culture of the African continent. With a combined number of more than 2500 performances of the main and the fringe programme events, the events range from jazz and classical music concerts to theatre, dance and ballet performances. It is recommended to book your tickets for the various events early as the event attracts annually thousands of visitors from all around the world. Ticket prices vary. They are available from the festival organiser's website. Free concerts take place at various times and venues as well. Check out the website below. * Immigration: New immigration regulations are in effect from 26 May 2014. While the regulations are seen as more restrictive for prospective expats, they are also seen as measure to counteract the trend of 'border-hopping' and curb corruption. VFS service-centres will start operating countrywide during the coming month to handle all visa applications. For more information see this information here. * Elections: The ANC's win of over 62.15% at last week's national elections ensured a re-election of Jacob Zuma who will have a second term as South African president. The Democratic Alliance (DA) won 22.23% of overall seats in parliament with a majority in the Western Cape Province. 6.35% supported the Economic Freedom Fighters (EFF), a new party headed by Julius Malema, who was banned from the ANC earlier last year. * Economy: The prime lending rate is kept at 9% due to the lower than expected GDP. The unemployment rate stands at 25.2% in the first quarter of 2014 and the inflation rate stands at 6.1% (April 2014) and is above the target range of 3%-6%. The South African Bookfair takes place from 13.-15. June at Cape Town International Convention Centre (CTICC). Please come and meet us, chat with us and celebrate with us as we launch our new 'Living in South Africa' guidebook. You will find us at Stand P17. Looking forward to meeting you! We are giving away 5 double tickets to the book fair to readers who reply to us before 3 of June 2014. To stand a chance to win these complimentary tickets, like us on our new Facebook group and leave a comment or reply to this newsletter. Make sure you join our new Facebook forum: Living in South Africa to get regular updates and share your thoughts. Join our friendly community and share your insights and tips on moving to and living in South Africa with other like-minded people. Looking forward to hearing from you soon. In our forum, on the blog and website, you will find many tips and news on happenings and events for expats and all who want to embrace life in South Africa. We welcome your great tips and comments!